Although I have not been posting that frequently lately, I have been quilting. I have been quilting, but not for me……only for others. I have been so busy with quilting for others that my life has slipped out of balance. My hobby–quilting–has been lost. Even my quilt tester, Joey, is starting to wonder if there is ever going to be a requirement for his quilt testing services in the future–he is not allowed to test customer quilts only my quilts. As you can see by this picture, he is currently considering employment in other fields–bird watching being one. Stay tuned for changes. Recent events have caused me to re-examine my role as a long arm machine quilter and have caused me to assess how much of my time in the future that I am prepared to devote to quilting for others at the expense of producing quilts for my own enjoyment. I am currently developing guidelines to assist quilt top piecers with determining if their piecing will best be complimented by my quilting style. I realize that just like there are many different styles of painters, potters, and other artists; there are also many different styles of long arm quilters. I specialize in the use of Circle Lord templates. I do not use pantographs or quilt freehand. The use of the Circle Lord products allows me to produce very precise designs providing consistent results equivalent to what the computerized machines are able to produce – but at a fraction of the price. The following guidelines are necessary for the preparation of quilt tops for long arm quilting. Following these guidelines will ensure that the piecer and the long arm quilter avoid disappointment and are both happy with the finished quilted results. - Must be 4″ longer and wider than the quilt top on all sides. - Pieced backs should have 1/2″ seams which are pressed open, selvages should be removed, and the backing overall should be squared up. - Even backings which are not pieced need to be square on all sides which includes straight edges on all sides. - All seams need to be pressed flat. - No wavy borders or borders with extra fullness. Quilt tops pieced with wavy borders will result in a wrinkled quilt after quilting. - The same size as the backing which is 4″ longer and wider than the quilt top on all sides. Thank you to all piecers who have entrusted your quilt tops to me in the past. I have appreciated the opportunity to work on your quilts. I have enjoyed the stories of the quilt’s origin whether it be the testing of a new pattern, piecing a special quilt for a relative or friend, acknowledgement of a milestone such as a new baby, wedding, significant birthday, or graduation. I have particularly enjoyed working on the quilt tops that have been left to the recipient as part of an estate which in turn have been entrusted to me to complete. Some of us will continue to work together in the future producing fabulous quilts and some of us will realize that there is a better fit out there somewhere between piecer and quilter. 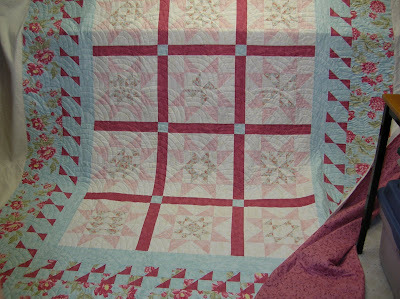 This entry was posted in circle lord, customer quilts, long arm quilter by Norma Hanson. Bookmark the permalink. 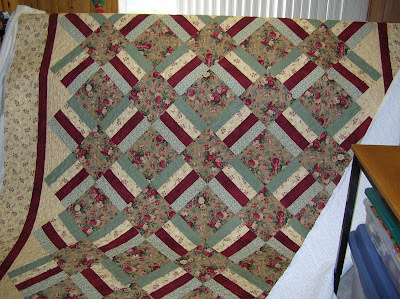 Looking at all the quilts you have been working on, I can see why your own quilting or piecing can fall by the wayside. Couple that with the busy end of year stuff at work, no wonder you haven’t had much time to call your own. I would say that the balance has definitely tilted but it sounds like you have an action plan to bring it all back in line. Knowing YOUR guidelines will make me more aware of the next one I bring to a long armer. I know I would not have normally stitched a 1/2 inch seam or pressed it open on that so it is a good thing for you to post what OUR quilter may be asking. That was good to read that advice. I am just getting a quilt ready to be quilted by a long arm quilter. I wasn’t sure if I needed to cut off the selvage or how wide to make the seam. I was just at a day long retreat were a quilter was working one of the exact quilts you were doing – the Thangles BOM one – picture #3. Very pretty quilt. Picture number 4 ( I didn’t include the cat -LOL) The one after the star quilt. If you get too busy or need to send some customers away because they don’t feel that your quilting style would work on their quilt, you could send them to The Quilting Bee Family. We hand-quilt every quilt and would be happy to quilt any design.